I caught a few minutes of Slap Shot on TV the other day including the scene where the Chiefs goalie Denis Lemiuex explains what it is like for a hockey player to spend time in the penalty box (video). His closing words “…and you feel shame” seem applicable to so many things we do in life, including eating burgers. If you’ve spent any time in fast food joints (and I’m guessing if you found your way to this blog you have) you’ve probably ended up in a second or third tier place looking to scratch that burger itch. Depending how far down the chain you have allowed yourself to go, I’m guessing you will at some point end up doing the walk of shame out to your car, or back to the office or worse to your spouse or friends having to explain just how far you’ve fallen. The chart above is my attempt to plot out my fast food burger experiences. There are places where I have gone, found the food to be amazing and then felt the urge to stand on the mountaintop and proclaim to the world that my taste buds have been sated and my soul has been strengthened by the manna from the g-ds. And then there have been places where I have almost instantly been filled with regret, embarrassed to mention how low I have dipped and yes – felt shame. I am taking a wild guess here by saying that I bet you have had those moments, too. For every story about hitting In-N-Out within 15 minutes of the plane landing in Las Vegas there is a tale that will never be told about a shameful trip to West Philly for a Baconzilla at Checkers. I know that Hardee’s and Carl’s Jr. are the same company but I really think they are on opposite ends of the spectrum. Now it could be the setting (my Carl’s Jr. experiences have obviously been on the West Coast, in California, Utah and Nevada – world’s apart from the Hardees in Harrisburg, PA that I walked out of last week) because the marketing shtick and food are pretty much identical. They really do seem to present the two brands much differently and I wish that wasn’t the case, because those of us on the east coast are getting the short end of the stick on this one. Check out Hawk Krall’s recent trip to Krystal (here). For those who are quick to dismiss them as a southern knock-off of White Castle remember that WC was born in the midwest, not Gotham City. My earliest Krystal memories are from my time living in Mississippi, taking bonding drives with my dad in our convertible. One of the best lessons he ever taught me was about letting things out of your control slide off your back as we watched a sudden thunderstorm dump gallons of water on our car while the roof was open. He just sat their casually eating his burgers waiting for the storm to quickly pass. Like a scene out of a movie I remember opening the car doors and watching tons of water flow out. We both hopped in, the car started up and off we went. This being Mississippi the car was dried out after a few minutes of driving and he carried on with no sense of panic or concern. It was after all just a car. If something had gone wrong we would have dealt with it, but part of me thinks the time we were spending together inside eating and talking about baseball was more valuable than whatever else could have occurred (plus the electrical system probably would have been completely shorted in the first few minutes, but allow me to wax nostalgic won’t you?). I placed McDonald’s just above and to the positive side of the middle on this chart because to me they are the control group. Their burger is the taste that I still compare everything to (thanks to Ray Kroc’s model of consistency breeds familiarity breeds happiness/brand loyalty). Harvey’s doesn’t get enough love from burger blogs. Damn shame. I need to get to Canada again soon. In lieu of that I’ll just listen to The Tragically Hip. Excellent chart. Great to see you posting again, although my chart would be slightly different. I would flip Checkers over to other side, but only because I’ve eaten there drive-thru style and it wrecked my innards. I would also move White Castle up on the pride scale. It’s another punch in the gut, but I’m always stoked when I’m there. Finally, how is Five Guys not jockeying for position with In-n-Out? ps – As someone who fights to get off a plane and into the nearest In-N-Out, I couldn't agree more with its placement on the chart! Canadian Harveys is horrible! 25yrs ago if you were drunk at 1am in Toronto, it was a destination of last choice, but not for the food. If you wanted a real burger you went to Tobys or maybe the newly opened Licks (both still exist but now just as boring brands). Harvey’s in any language is just not good. I thought that would be more in the Gut Punch/Shame quadrant. 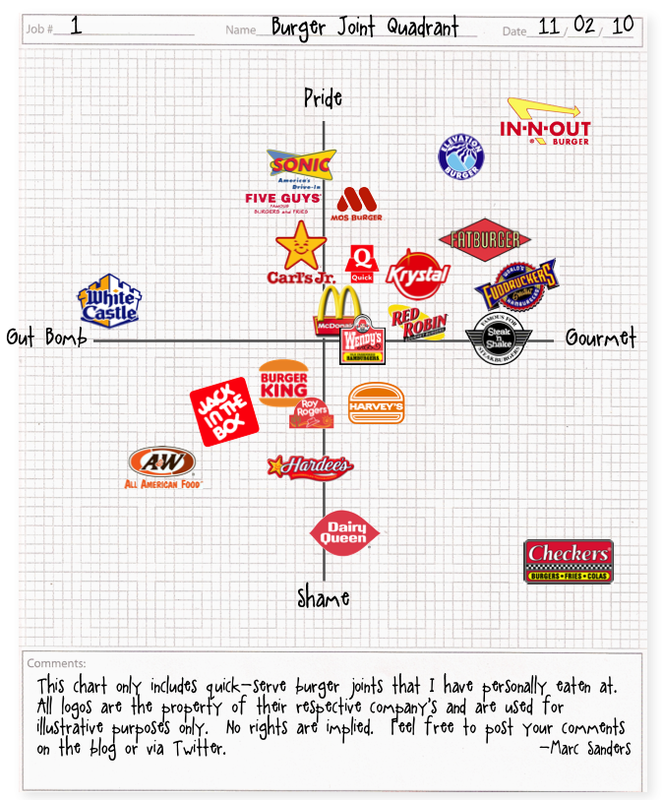 Do agree that Five Guys should be moved further to the right into the Gourmet/Pride quadrant. And any food run story that involves shame is one that must be told. We’ve all been there. You ate a burger at Dairy Queen? Your are truly dedicated to your craft. I have been craving Fuddruckers for a while now. So glad to see how high they ranked on your chart. Sad to say I don’t like beef so some of these places I will never experience the same way as you. Love it! I hear that you’ll be in Pittsburgh again this summer. As the sous chef at Burgatory Bar, I hear that you might come and visit us. After that, I hope we’re good enough to make the chart! Thanks for finding the site and your comments, J.C. 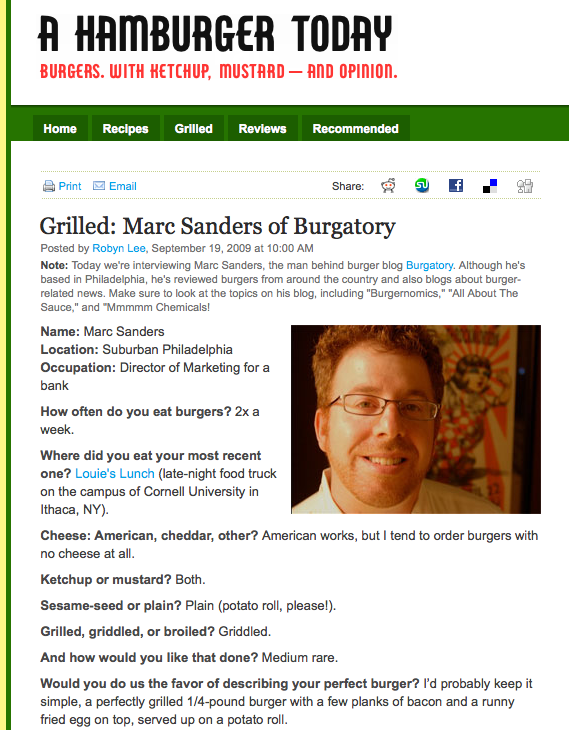 I am looking forward to hitting up Burgatory Bar this summer. From everything I’ve read, people are loving the burgers. Congrats. The burgers really are great. And don’t forget about the milkshakes! We went on Friday last week and we were astounded by the place. I have had the pleasure of visiting some of our nations finest burger joints this year and I have to say that Palena Cafe in DC is the best. If you have not been there go today! Love this chart! Informative and hilarious at the same time. Disclaimer: I work with Elevation Burger, so obviously I’m happy to see them floating up in the “gourmet / pride” quadrant… 🙂 Keep up the great burger world insights. Thanks for finding the site. Glad you like/agree with the chart. Now how do we get the folks at Elevation Burger to add bacon to their menu? McDonalds seems too highly rated. You have to get Smash Burger on this grid! I like your chart although I think that Harvey’s is just plain awful. When I was a kid it was quite good but it’s really not that good. If you like it though, who am I to stop you. Oh, and if you get up to Toronto you need to check out The Burger’s Priest. Modeled on In n’ Out. Awesome burgers. Probably the best I’ve had. In the east San Francisco Bay area is a small local chain named Nation’s Giant Hamburgers that left memories of yumminess that have not been experienced since 1992. Excellent value for the price back then and I wonder if the firm has maintained that subjective feeling I hold/held? Bestest ever burger of all time? The roach coach appearing at the dismantling yard every weekday around 10:30 am. As the bosses’ kid proclaimed, ALL their food had a subtle “oriental taste” that was so very good; even their double cheeseburger on sourdough roll. Back in the mid-1960s had an exquisite cheese burger from a long-defunct Sno-White burger joint in Livermore, CA. They had a dryish coleslaw topping that greatly enhanced the burger’s yumminess. Now, atop the Ozark plateau, the vast majority of burger vendors are the mainstream found everywhere chain joints with a few regional chains and a very few independent burger outlets but none that I have tried offer anything special and no good economic deals anywhere other than the dollar menu stuff. -Five Guys goes up with In-n-Out. -Red Robin goes all the way out to the edge of gourmet. -FuddRuckers.. it’s honestly equal parts gut-bomb and gourmet. -Hardee’s is definitely way more gutbomb.